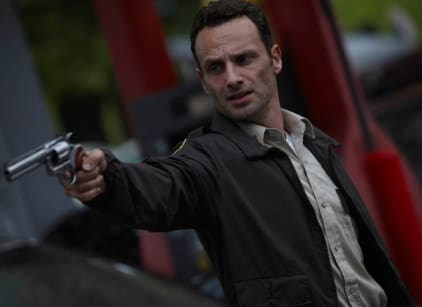 - Rick Grimes and his partner Shane Walsh get into a shootout with a group of men. Rick is shot twice. - Rick wakes up in the hospital to discover it’s abandoned. - He walks past a number of dead bodies to get to his home. He discovers that his wife and son are gone. Rick can’t believe what has happened. - Rick meets Morgan Jones and his son. They bring him in and reveal what has happened to the world. - Morgan’s wife has been turned into a zombie. - After showering at the station, Rick leaves Morgan and heads to Atlanta. - Morgan attempts to shoot his wife but is unable to do so. - Shane is alive and leading a group of survivors outside of Atlanta. Rick’s wife, Lori, and son, Carl, are alive and apart of the group. They hear Rick’s voice but are unable to stop him from going to Atlanta. - Rick stops at a house for gas and ends up borrowing a horse for his transportation. - Rick rides into Atlanta only to discover that it is overrun with zombies and not the safe place he was looking for. - He escapes the mob of zombies by crawling into a tank. Rick hears a voice on the radio. - The camera pans out to reveal the cockroach like zombies all over the city.